The heading and first paragraph in bold print is the main one to include your media. Please email me if you need a shorter press release or if you place it in your media. Address: 9 Leonard St, Tolga, Queenland, Australia, 4882. Advantage Innovations is formed by disabled Inventor Richard Hole from North Queensland in Australia, which is a hikers paradise. Despite pain from a recent accident he is planning a hike to the top of Queensland's highest mountain, to lobby for the poor. Prior to his amputation, he had done much bushwalking and experimentation to test his ideas, and has come up with many unique inventions at http://www.advantagein.com These inventions save much space and weight while carrying gear, yet give increasing comfort. They include revolutionary tents, which could be the lightest ever invented. These tents contain a unique feature. They trap heat around your body only when needed. He also has a backpack frame that separates your back 100% away from your pack, and keeps your back cool and comfortable. It is also suitable to use as a backrest for seats, or can be used for carrying babies. Another invention is a thermal suit that can fit in your pocket. Richard also has many other inventions and sites linked. The tent weighs as little as 790 gram or 28 oz, but has sufficient room around the body. An apex zip and pantry enable easy movement and provide extra space for storage of gear. Another unique feature is that the tent traps heat around your body, (like a greenhouse), only when needed, yet gives adequate ventilation to the head region. Richard also designed a back pack frame which separates your back 100% from the pack. Your back rests on soft porous straps, which comfortably cushion your back, and allow cool air to ventilate your back while carrying a pack. The frame also cools your back while resting in seats, or while carrying a baby. He has also developed a super light thermal suit that fits in your pocket and is suitable for adventure, survival or any emergency. It is so important to save carrying too much weight while hiking, backpacking or camping, and it is such an advantage to remain as comfortable as possible. These inventions will help anyone including Richard, who is keen to do more bush walking again. Richard had major car accident in which he lost a leg after a head on collision, when a car veered on to the wrong side of the road. While he has been recovering, Richard has spent most of the time on the computer, designing and promoting his many different web sites, which include Christian sites, a wide range of inventions, a lobby group for helping small businesses and helping to improve our economy, and many others. 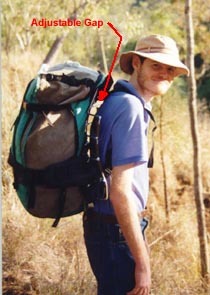 The photo shows Richard with a unique backpack frame he invented and now marketing at http://www.advantagein.com/backpacks Comfortable porous straps maintain an adjustable gap between the pack and his back.